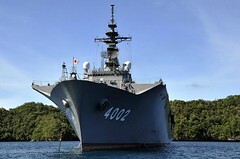 JS Shimokita (LST 4002) departed Palau Aug. 15 after a multinational team aboard completed two weeks of medical and engineering initiatives designed to promote cooperation and knowledge exchange with local authorities. 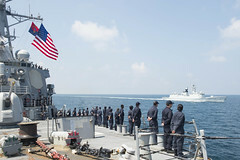 USS Benfold (DDG 65) conducted coordinated maneuvering events, Code for Unplanned Encounters at Sea (CUES), and search and rescue training with the People’s Liberation Army (Navy) frigate Daqing (FFG 576), Aug. 12. 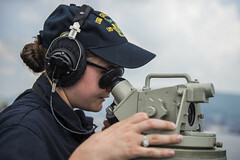 U.S. Pacific Fleet has launched a pilot program that provides opportunities for junior officers and enlisted Sailors in the ever changing field of cybersecurity technology. 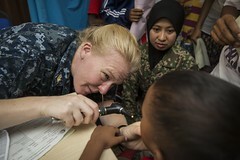 USNS Mercy (T-AH 19) and the multinational Pacific Partnership team departed Kuantan, Malaysia, Aug. 14, marking the completion of Pacific Partnership 2016’s fourth mission stop. 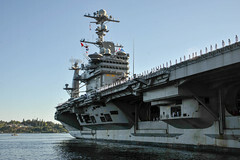 More than 3,000 Sailors aboard USS John C. Stennis (CVN 74) returned to their homeport of Bremerton, Wash., Aug. 14 following a seven-month Indo-Asia-Pacific deployment. 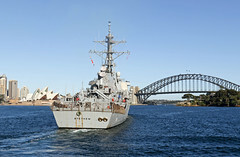 The guided-missile destroyer arrived in Sydney, Australia, Aug. 14 for a port visit that includes demonstrating Great Green Fleet energy conservation measures to senior U.S. and Australian officials. 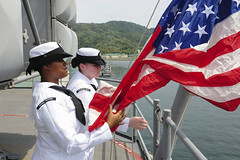 All three forward-deployed ships of the Bonhomme Richard Expeditionary Strike Group (ESG) are now underway from Sasebo, Japan, for a routine patrol in the U.S. 7th Fleet area of operations. 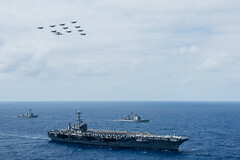 More than 7,000 John C. Stennis Strike Group Sailors returned to San Diego Aug. 10 following a seven-month deployment in the Indo-Asia-Pacific. 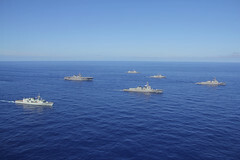 Ships from Australia, Canada, Japan, South Korea and the U.S. participated in a post-Rim of the Pacific (RIMPAC) multilateral exercise in the Hawaii operating area, Aug. 5-9. The amphibious assault ship, along with the embarked 13th Marine Expeditionary Unit arrived in Kota Kinabalu, Malaysia, Aug. 9 for a port visit.